Looking for a bus in Manhattan? New York Charter Bus Company has access to hundreds of buses to take you to Central Park, Rockefeller Center, and more. Home to many of New York City’s top attractions, travelers from all over the world place Manhattan at the top of their itineraries. From site-seeing tours and Broadway shows to exhibitions at the Modern Museum of Art, your group will have limitless options for things to see and do in NYC’s most popular borough. Need reliable transportation to and from Manhattan? Call New York Charter Bus Company today at 917-388-9602 to learn about our selection of clean, modern coaches. We’ll help you choose from compact minibuses, full-sized coaches, and everything in between to ensure your group has the right amount of space for passengers and luggage. In a busy borough like Manhattan, charter bus reservations fill up quickly, so reach out to us today for your no-obligation quote. Planning an event in Manhattan? 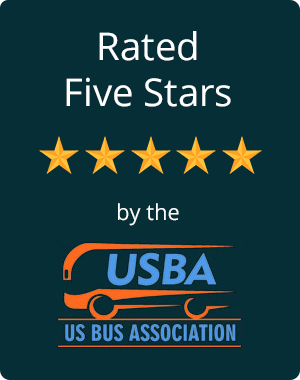 We’ll pair you with comfortable, clean charter bus rentals to transport you to your destination. New York Charter Bus Company makes it easy to book minibuses and full-sized coaches for family reunions, school field trips, corporate events, sports tournaments, weddings, and any other occasion. For a fun, comfortable ride through the big city, request a bus with WiFi, power outlets, television monitors, cushioned seating, and more. We’ll do everything we can to accommodate your amenity requests when you call to make your reservation. If you’re planning a long-distance trip, your passengers will have plenty of room to socialize and relax on board the charter bus. Full-sized coaches come with luggage bays below the cabin and overhead bins above the seats for small items, ensuring all of your belongings are safe and out of the way. If you are flying out of La Guardia or JFK with a smaller group of people, a minibus will provide plenty of room to shuttle you from your pickup location to the airport. For more inspiration for your itinerary, as well as estimated Manhattan charter bus prices, check out our NYC travel guide. Make your Manhattan trip infinitely easier by booking your charter bus today with New York Charter Bus Company. When you call our reservation specialists at 917-388-9602, we’ll provide you with a custom, no-obligation quote based on your trip details, and we’ll guide you through our simple reservation process in minutes. We’re looking forward to serving you today!